Many, if not most, stars vary in brightness, typically by just a little and very predictably. These changes occur on timescales from minutes to years, and can tell us about the internal structure of stars in a way that no other observations can. But recently, a team of astronomers used ESO facilities to discover an extreme variable star named VVV-WIT-07, with WIT being short for “What is this?”. Seen from Earth, this strange star suddenly and irregularly reduces in brightness by 30–40%. In one extraordinary case it even dimmed by about 80%. But “normal” stars just don’t do that. The research was led by Roberto Saito from the Universidade Federal de Santa Catarina. ESO astronomer Valentin Ivanov was involved in the research and tells us more. We made this discovery whilst searching for extreme variable stars in the innermost parts of the Milky Way using ESO’s VISTA survey telescope. This was part of a survey of the Milky Way — named VISTA Variables in Via Lactea, or VVV for short — that we have been working on for many years. The survey is the first to image the most crowded and obscured regions of our home galaxy with high angular resolution at infrared wavelengths. The high angular resolution helps to separate the billions of stars that are superimposed close together on the sky and observing at infrared wavelengths makes it easier to see through the dust that — just like fog hides magnificent views on Earth — blocks our view of the most interesting parts of the Milky Way. The Milky Way arcing over VISTA, the Visible and Infrared Survey Telescope for Astronomy, used to discover VVV-WIT-07. A key word that could be used to describe our finding is extreme. In every aspect. VVV-WIT-07 in the centre of a star field. A key word that could be used to describe our finding is extreme. In every aspect. Extreme objects are always the most interesting, because they push the limits of our knowledge beyond the well-known and well-understood comfort zone. The extreme places are where new discoveries await. And surveys like VVV are a great way to identify such objects because they scan a lot of the sky many times over. Whilst we have found a number of extreme objects through the VVV survey so far, possibly the most mysterious is the highly varying VVV-WIT-07, which doesn’t fit with any known class of variable star. Over eight years, we observed this star 85 times through the VVV survey. The first observations showed nothing strange — simply a mild scatter in the brightness measurements, consistent with the observational uncertainties. However, in August–September 2011, just before the end of the observing season, the star dimmed by a factor of almost two! By June 2012, when we began re-observing it, the star’s brightness was nearly back to normal. But by mid-July, it had dimmed by almost 80%! Then it was back to its usual self in about a week. The data taken since then contain hints of additional drops in brightness, but nothing so dramatic. By June 2012, when we began re-observing it, the star’s brightness was nearly back to normal. But by mid-July, it had dimmed by almost 80%! Our first reaction was “this can not be” — this is just a healthy pessimism, common among scientists. But once we inspected the images and checked the observations, it was clear that we had come across something very strange. Since making this discovery, we have been asking ourselves why this star varies so much in brightness, but that’s not a simple question to answer. One relatively likely possibility is that an object (or even multiple objects!) is orbiting VVV-WIT-07, passing between us and its host star, blocking some of the light. Given the drastic light loss, this object could a ringed exoplanet, but with extreme, giant rings, far larger than those of Saturn. Or it could be a family of comet-like objects that occasionally block up to 80% of the starlight. Lightcurve of VVV-WIT-07 showing how it varied in brightness between 2010 and 2018. The insert shows an expanded view of the particularly dramatic dimming event that occurred in July 2012. Another possibility is that VVV-WIT-07 may be surrounded by a clumpy or warped disc, oriented nearly edge-on from our point of view, and the dips in brightness are caused by the clumps, or the warp, crossing the star and blocking its light. All these options involve extremely rare classes of objects. So far astronomers know of only one case each for a passing Saturn-like planet and comet family, and just a handful of cases of edge-on clumpy or warped discs. And the host stars in those cases don’t resemble VVV-WIT-07 at all. Indeed, VVV-WIT-07 is a strange object, fully justifying the “What Is This” in its name. 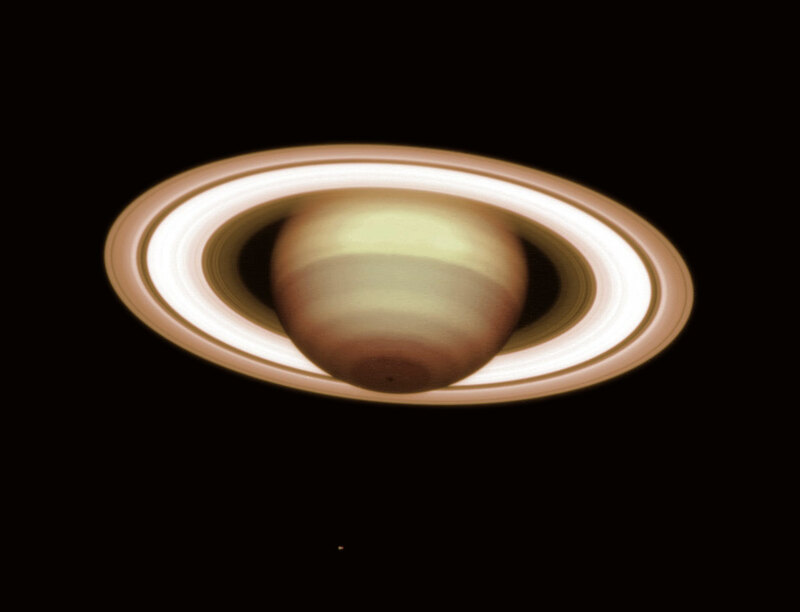 Giant planet Saturn, as observed with ESO´s Very Large Telescope NACO Adaptive Optics instrument. 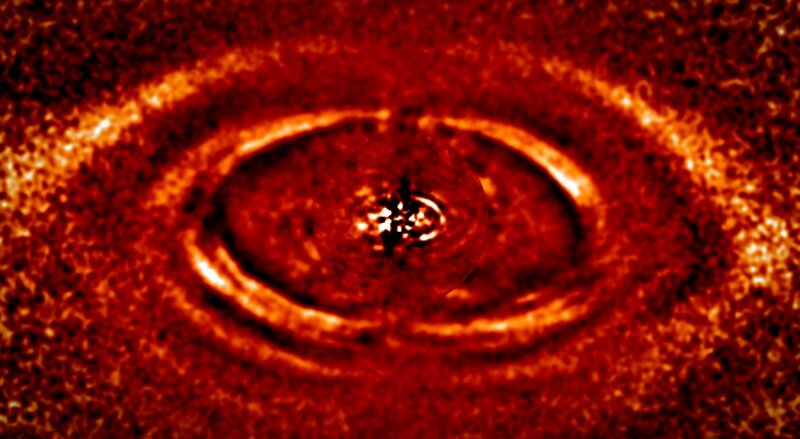 SPHERE image of dust rings around a nearby star. The disc is clumpy — something astronomers currently have no explanation for. It´s possible that this phenomenon is caused by the presence of planets. The possibility of finding new worlds is always fascinating, but we have identified a system that challenges the imagination even more than usual, because it is so unlike our own planetary system. The unusual dips in the observed brightness of VVV-WIT-07 remind us of the famous Boyajian’s Star, that dims as much as 22% — still a feeble amount compared to our star’s brightness reduction of 80%. We have identified a system that challenges the imagination even more than usual, because it is so unlike our own planetary system. Huge variations in brightness are common for stars in binary systems with two stars of near-equal mass, when one passes in front of the other. But through our observations we see clearly that VVV-WIT-07 is not a binary star. The only previously discovered non-binary star to dim by a comparable amount is Mamajek’s Object, which is the previously-mentioned star shadowed by a passing planet with a gigantic ring system. Further observations are needed before we will be able to draw a firm conclusion about what causes this phenomenon. We are continuing to monitor it, hoping to catch it in the act: during a dip. Then we will attempt to obtain new types of observations that should help us to find out what causes this strange behavior. Valentin D. Ivanov was born in Bulgaria. He holds a Master’s degree in Physics from University of Sofia and a PhD in Astronomy from the University of Arizona. He has been working at ESO since 2001. His research interests range from Solar System objects to distant quasars. In his free time he writes science fiction; his stories have appeared in Bulgarian, US and German publications. Science Snapshots showcases quirky or interesting scientific results using ESO telescopes from the larger scientific community. Find more interviews with astronomers and stories about astronomical research at ESO here on the ESOblog.